Moina Belle Michael (1869-1944) was a professor at the University of Georgia when World War I began, when she became a volunteer trainer for the YWCA. Inspired by the Canadian poet John McCrae’s tribute to the war dead (“In Flanders fields the poppies grow . . .”), she vowed to wear a red poppy in their memory. Later, she promoted the idea of selling tiny red silk artificial poppy flowers as a way of raising money to help disabled veterans, which was supported by the American Legion, and became a national campaign. We have very early school memories of our parents giving us a dime to take to school so we could buy our poppy on Veteran’s Day each year. 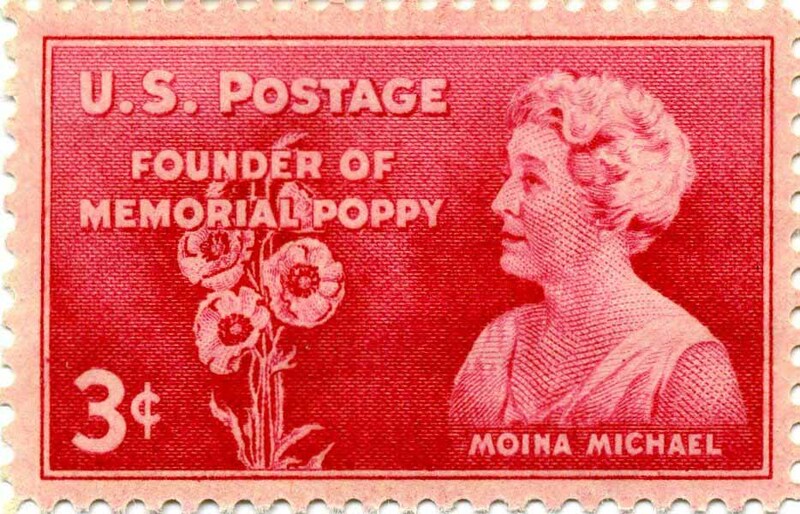 Michael became known as “the Poppy Lady,” and had a postage stamp issued in her memory in 1948, as well as a “Liberty Ship” named for her in the Second World War. The World War II Liberty Ships were built to supply the war effort in Europe in the face of massive loss of merchant ships due to U-boat torpedoing. Over 2,700 of the 440-foot ships were built by 18 American shipyards from 1941 to 1945. Most were built in about one month – a phenomenal achievement. SS Moina Michael was launched on November 9, 1944. She saw service until the war’s end, and was finally broken up for scrap in 1971, in Florida. 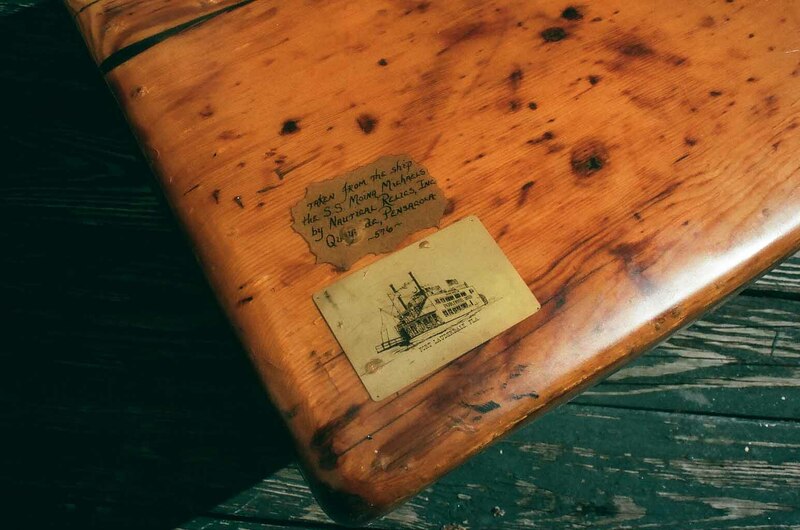 A canny preservationist company, Nautical Relics, Inc., of Pensacola, Florida, obtained the deck hatches, which were beautifully reclaimed, and, inlaid with plaques and medallions giving their provenance, used as table tops for the riverboat Paddlewheel Queen, a cruise boat and restaurant based in Fort Lauderdale. 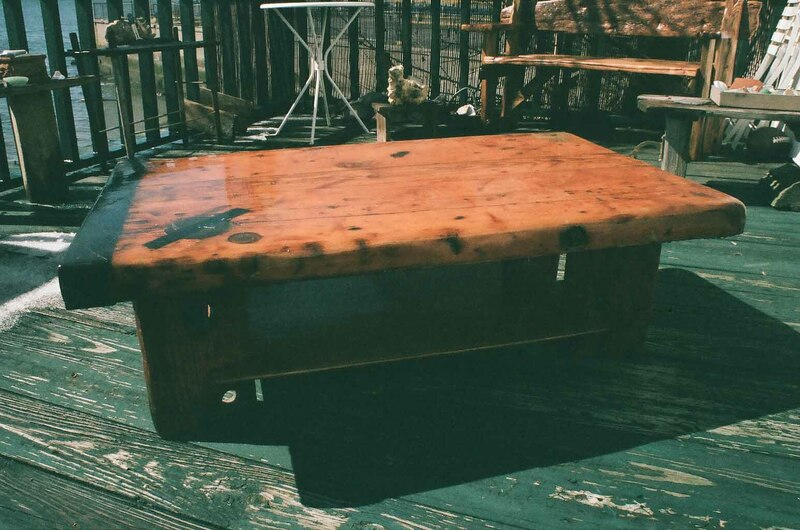 Some of these table tops eventually made their way to an antique shop in our little nautical community here in New York City, where we purchased one for use as a coffee table top. The hatch evinces the simplicity with which the ships were constructed. Two inches thick and about four feet long, its planks are joined by a simple rivet: an iron rod whose ends were heated red-hot and the pounded out over a large pan washer on each side. The lifting end is bound by an iron strap, and has a lifting strap, recessed so that the seamen wouldn’t trip over it. The hinged end has been trimmed off by the makers of the original table tops, and the whole encased in acrylic to protect it. Our table’s legs are reclaimed dockwood, and the shelf beneath it is a teak panel from the beautiful 1920s motor yacht reportedly once owned by the film star Mae West.